Blurb: "A fragrant blend of Keemun and other fine China teas, producing a delicate nutty flavour". Leading off is the somewhat-polarising Russian Caravan tea, here represented by the Twinings teabag version (they also do a leaf-tea pack). I first tried Russian Caravan back in 2004, when the parents of my then-girlfriend were given a sampler box of different tea varieties, and found that nobody wanted the Russian Caravan. So I decided to try it. It made something of an impression, although I don't think I drank it again until several years later at High Tea at the (Brisbane) Stamford, when I somewhat foolishly ordered a whole pot of it (in fairness: when they serve all-you-can-drink tea, you don't stick with the thing you've got at home). The rest of my table - none of whom were tea-drinkers - found the aroma distinctly disgusting (an opinion they choose not to keep to themselves). One of my tablemates, who has since become my wife, subsequently refused to be present while Russian Caravan tea was made or consumed, and only came around after I introduced her to Lapsang Souchong, a tea so, um, noticeable in its aroma (& taste, for that matter) that even through several layers of packaging it can make dogs weep and train tracks buckle. Next to that, Russian Caravan smells like slightly insipid water. Its most prominent flavour is actually a smoky taste and smell - in that sense, quite neatly capturing the world of the long journeys by which the tea originally made its way from Asia to Russia (hence the name). It has a taste & smell almost of Australian billy tea, tea made over an open fire while camping. The Twinings packet suggests drinking it with milk or lemon, but - as usual for me - I prefer it black. That way the full flavour is allowed out, and despite the distinctive aroma, Russian Caravan is actually not a overly flavoured tea. Actually, it's quite a smooth flavour, quite drinkable, even though I wouldn't choose to drink it every day for the rest of my life. * Less-kind descriptions have also been used. Joel, it has been too long since your last review. Review something please. Hi Joel, have you seen Twinings has released a 'new' tea, Australian Afternoon? I have. I am very eager to try it. Kevin Rudd created it, and we all know he can do no wrong. over here in NZ, Twining released a superb blend, New Zealand Breakfast Tea. I doubt you Oz Yobs will see it in your shops, but it's the House favourite over here. BTW, I LOVE Russian Caravan - to hell with "black, no sugar" this tea should be drunk like any good gumboot tea - strong, sweet and milky. Anyway, I've looked at the NZ Breakfast Tea, and it sounds pretty great. Nope, we poor Australians haven't got it. It'd probably do pretty well over here (especially with a name change...), so I hope Twinings gets on that. ... and before I go, how about a tea joke ? Thanks for that offer, but some investigations subsequently revealed that Twinings does in fact sell the NZ Breakfast Tea here - albeit only on their website, I think. So I might invest in some of those soon. Will let you know how it goes! Have you tried other Russian Caravan teas? T-Bar do an amazing one that is best characterised by the word 'Smokey!' It is so smokey it just about catches fire. 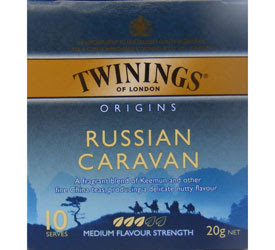 By contrast, the Twinings Russian Caravan is 'just' black tea. I bought it expecting a smokey punch, and was sadly disappointed!